Track my Medz is one of the best Amazon Alexa Skill to track your daily medicines intake. This skill helps Alexa keep tab of which medicine you need to take; It helps avoid double dosage, missed dosage and also provides detailed logs of all your medicine intake. As a user, you can either log the medicine you have just taken or ask Alexa to tell you whether you have already taken a medicine, what are your next medicine due, etc. 1: Open your skills section of Alexa app or go to https://alexa.amazon.com/ and search for Track My Med. Select Track My Med and then click on the “Enable” button”. 2: This will open a popup screen. 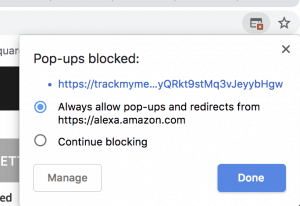 If your browser prohibits popups then you will need to click on the right corner of the URL bar of your browser and you may see the following screen. Make sure you click on the blue link to open the popup page. 3: The popup will show a screen with username and password and will allow you to signup. Here you will need to create Track My Medz account. This window is NOT asking for your Amazon Alexa account info, you need to create a new TrackMyMeds Account if you do not have one already. So you can click on the signup link and enter your information. You don’t need to remember this info initially. Please create a username and password and provide an email address. You will need access to this email address in order to verify the account. A verification code is then sent to your email. After you enter the verification code in next window. Your account will be linked and you will see a screen similar to the following image. 4: You now have the Track My Medz Alexa skill ready to use. 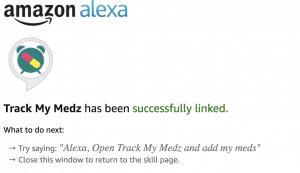 Track My Medz has many features and options, so we suggest starting by asking Alexa to just “Open Track My Medz”. The very first time you use the skill, it will ask you to add the medicines you need to take. You first provide the name of the medicine; second, the dosage of the medicine (how many times a day you need to take the medicine); and third duration, ie for how many days you need to take the meds. Once this info is added, you can ask Alexa to log your medicine intake, ask the next medicines due, or add another medicine. We really want to improve our Amazon Alexa skill and the overall usage. We would love to hear your feedback and add features to it. We urge you to provide your feedback and help us make this a useful solution. Please click here to provide feedback and request any features. 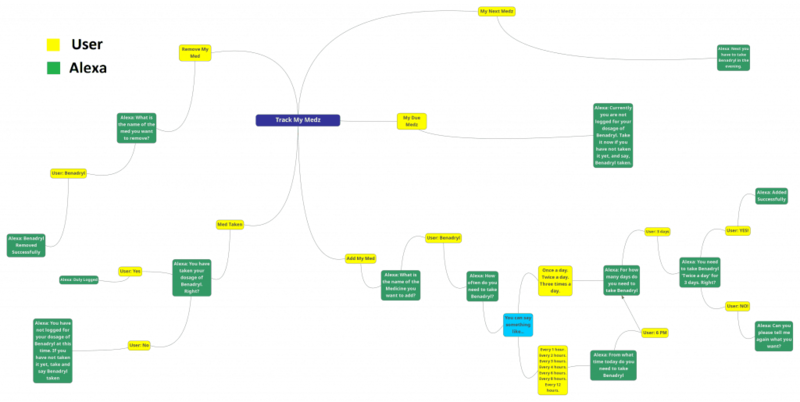 If you like to get a consultation to create an Alexa skill of your own, please click here. Technosoft specializes in offshore healthcare software development services. please contact us at 203-208-8866 or send an email to info@techno-soft.com.